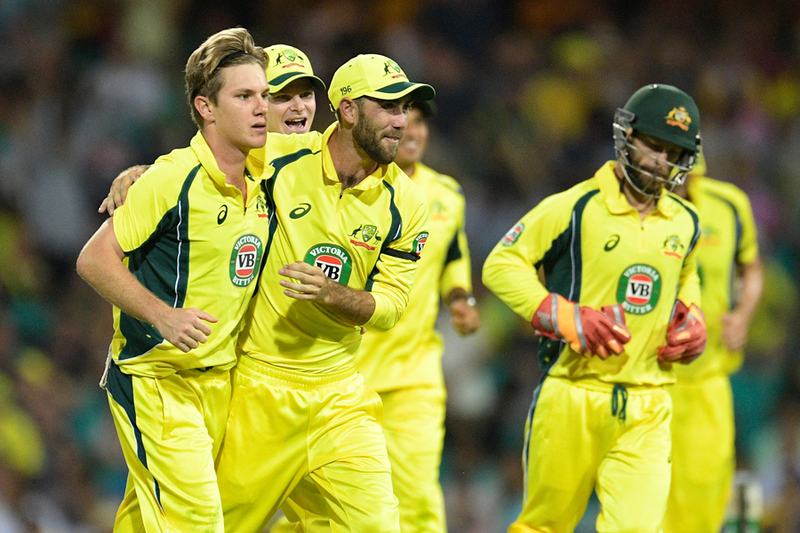 Adam Zampa celebrates a wicket of Pakistan during the 4th ODI at Sydney on Sunday. Australia secured the one-day series against Pakistan with a commanding 86-run win at Sydney Cricket Ground on Sunday, taking a 3-1 lead in the five match series. Set an imposing 354 to win, Pakistan were never really in the hunt. After Australia made 353 for six on the back of a David Warner century that was aided by appalling fielding from the tourists, Pakistan replied with 267 from 43.5 overs. Opener Sharjeel Khan whacked out 74 from just 47 balls, but once he fell to recalled leg-spinner Adam Zampa Pakistan's fate was all but sealed. Warner backed his form with the bat by doing what the Pakistanis couldn't and hanging onto two excellent catches. After Australian captain Steve Smith won the toss, the home side took advantage of a placid wicket and the hapless Pakistan fielding. Warner led the way but Pakistan did not help themselves, conceding a number of overthrows and dropped catches at crucial times. He made 130, finishing with 11 fours and two sixes. The left-hander was dropped on 113 when Hasan Ali grassed a simple chance at mid-off from spinner Imad Wasim. Smith scored 49 off 48 balls but was let off when he had made just 10 when Sharjeel made a lazy one-handed attempt at gully from Junaid Khan's bowling. Sharjeel also dropped Travis Head when he was on 28, again to the chagrin of the luckless Junaid. Head went on to make 58 off 36 balls. And Hasan put down a difficult chance off Glenn Maxwell when he was on eight and the Australian went on to score 78. Despite his two dropped catches Hasan at least redeemed himself by taking five for 52, easily the best of the Pakistan bowlers. Warner and Smith put on 120 for the second wicket to put Australia in a commanding position before Hasan removed both in the space of three balls to give the tourists some renewed hope. However, Head and Maxwell then cut loose to add 100 for the fourth wicket in just 64 balls. Maxwell faced just 44 balls, hitting 10 fours and a six. Pakistan recalled captain Azhar Ali after a hamstring injury at the expense of Asad Shafiq, while Australia recalled Mitchell Starc and spinner Zampa for James Faulkner and Billy Stanlake. Zampa, controversially overlooked for the upcoming India tour, took his opportunity with 3-55 from his 10 overs.